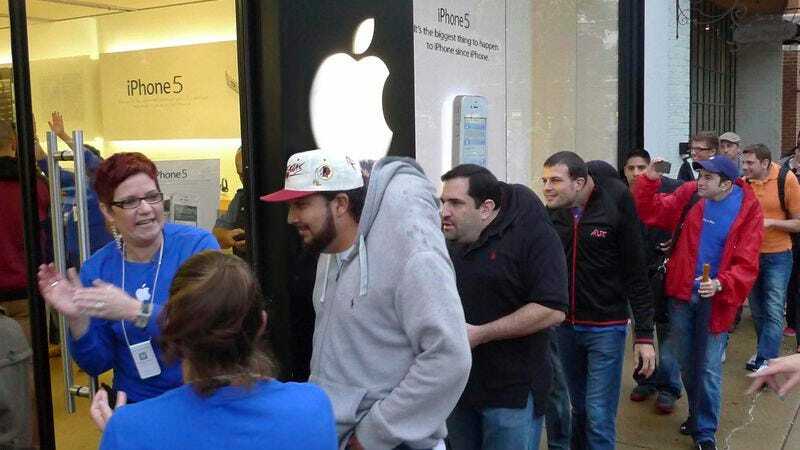 LOS ANGELES—The nation’s hunchbacked, out-of-breath iPhone users lined up outside Apple stores throughout the country today to purchase the new iPhone 5, which boasts a widely anticipated slimmed down, lighter design that promises to no longer irreversibly misshape the curvature of users’ spines. “I’m really excited for the iPhone 5’s 4G connectivity and the fact that it won’t dislocate my shoulder whenever I pick it up to answer it,” said severely disfigured graphic artist Gabe Brittell, 32, huffing and puffing under the weight of the hefty previous version of the device that he had strapped to his back via strong, braided nylon cords. “Finally a thinner model that won’t shatter my hip and take 20 years off my life by permanently deforming my torso and vertebrae!” Executives said they anticipated sales of the iPhone 5 to be down compared to previous years, citing the roughly 2 million Apple fans who have been crushed to death under the iPhone 4S.